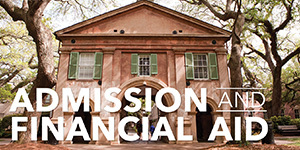 Interested in studying Chemistry or Biochemistry at the College of Charleston? Please complete a short prospective student survey and we will be in touch with more information about our program. 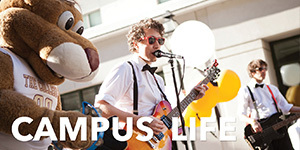 Let us know when you are on campus and we are happy to schedule a tour of our facilities! 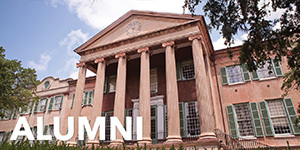 843-953-5587 or email gelascop@cofc.edu. 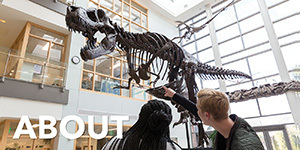 The mission of the Department of Chemistry and Biochemistry is to provide a supportive yet challenging learning environment where students benefit from a talented, accomplished faculty and staff, state-of-the-art facilities, hands-on use of modern instrumentation and a culture that emphasizes experiential learning and development through participation in faculty mentored research. In all of our actions we strive to improve our students’ critical thinking skills, content based knowledge, and an appreciation for the scientific method and ethical expectations of scientists. Mentorship of our students is essential to their success, which is evident in our students' success in competing for prestigious national awards. Maddie Gordon ('15) recieved the NSF Graduate Research Fellowship in support of her graduate studies at Berkeley where she is currently pursuing a PhD. Travis Varner ('16, pursuing a PhD at UNC) and Michael Hollerbach ('17, pursuing a PhD at Emory) recently recieved honorable mentions. Five students from Chemistry and Biochemistry have been awarded a highly competitive Goldwater Scholarships since 2013 (pictured below, left - right): Alex Schwartz (‘18), Alyssa Johnson (‘18), John Cobb (‘18), Nathan Adamson (‘15), and Brenna Norton-Baker (‘15). No other academic department in the state of South Carolina has matched this success rate for the Goldwater Scholarship over this time same time period. Our department offers the following undergraduate degrees: BA in chemistry, BS in chemistry, and BS in biochemistry. The BS degrees are certified by the American Chemical Society. In addition to traditional courses in organic, inorganic, physical, analytical and biochemistry, we also offer unique elective courses that include the Science of Wine, environmental chemistry and industrial chemistry. Of all the experiences our department offers, undergraduate research is the most valued by our students. Students who participate in research in our department have the opportunity to work one-on-one with a faculty mentor on a research project. 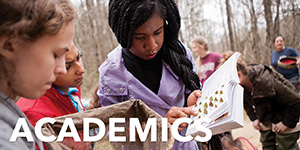 During the academic year, students can earn up to ten credit hours conducting research and stipends are usually available for students interested in doing summer research. Each year we typically have 40 – 50 students who spend their summer immersed in a research project with their faculty mentor. Our undergraduate students frequently present their work at regional and national meetings and co-author papers in reputable peer-reviewed journal. 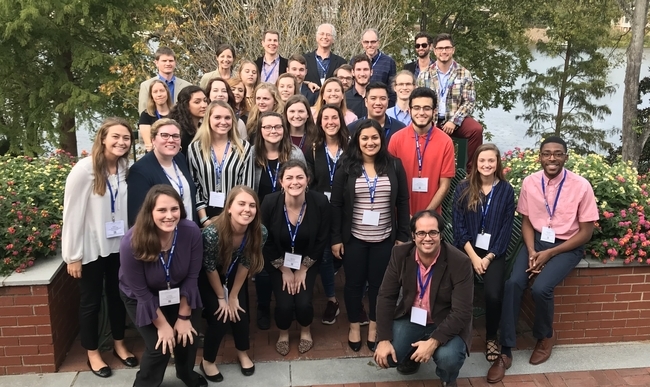 Pictured below are students attending the 2018 South Eastern Regional Meeting of the American Chemical Society in Augusta, GA to present their research. Most students who graduate from our department go on to top graduate or professional schools, or obtain employment in the sciences. 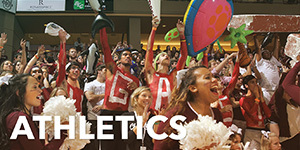 Check out our alumni page for a sampling of their accomplishments. And if you are a graduate of our program, please let us know what you are doing now!